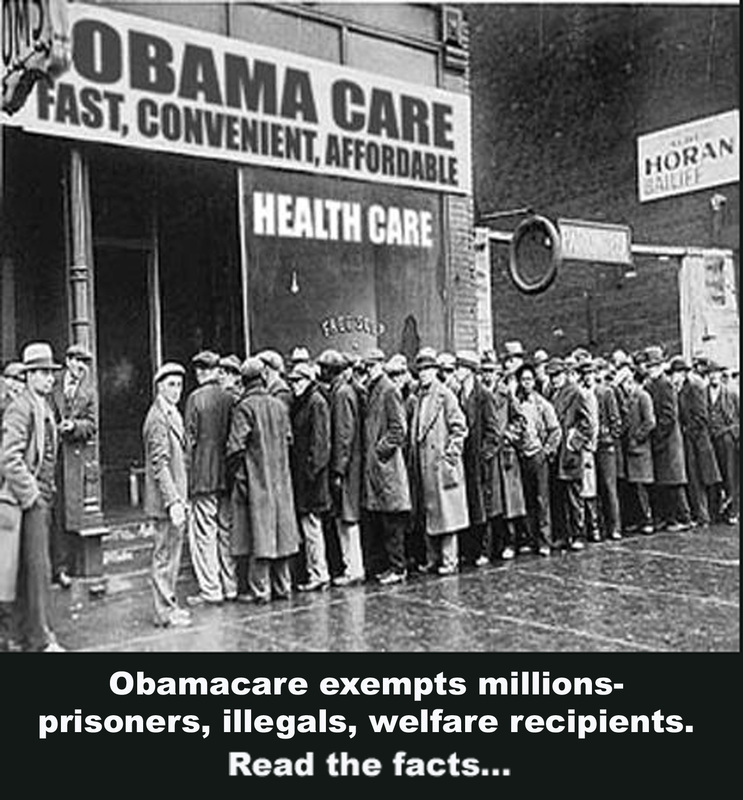 Obamacare exempts millions–prisoners, illegals, welfare recipients. 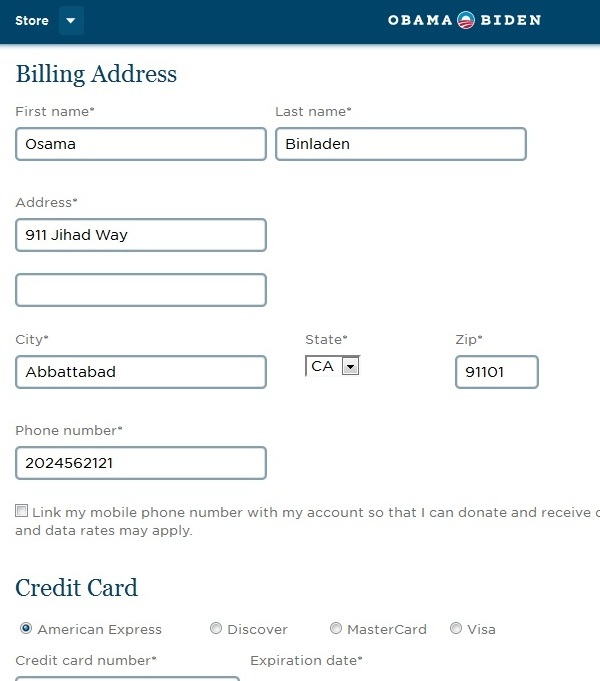 Mock Obamacare tax form from critic Americans for Tax Reform. In just 14 months, Americans will be required to prove that they have federally “qualified” health insurance or face an Obamacare tax of $695 to $2,085. That is unless you are in prison, below the poverty line, or are an undocumented immigrant, according to the anti-tax group Americans for Tax Reform. When added together, those three groups total up to one-sixth of the nation’s population of 314 million: 218,929 are in federal prisons, 12 million are illegals and 42 million are below the poverty line and eligible for welfare, though some fit into all three categories, according to federal reports. Based on other IRS requirements, ATR said that Americans will have to show that they have health insurance “qualified” by the Department of Health and Human Services. They will also have to disclose if they were covered by a qualifying plan during the year and for how long. And they could be subject to penalties and interest on unpaid Obamacare taxes for periods they were not covered. Their mock form includes groups qualifying for exemptions from the Obamacare health insurance mandate and tax. “Classes of individuals who are exempt from the mandate include but are not limited to: those serving sentences in the federal penitentiary system; those persons not legally able to work in the U.S.; welfare recipients (since they are below the poverty line); and those qualifying for an HHS-granted religious exemption,” said ATR, citing section 1501 of the Affordable Care Act that also exempts many others, including native Americans. Battery maker A123 Systems vowed thousands of new jobs when it received a nearly quarter-billion-dollar stimulus grant in late 2009, but federal job-tracking figures show only a few hundred positions were created before the company joined a growing list of federally backed energy businesses that ended in bankruptcy. The latest quarterly report on file with a federal stimulus tracking database shows just seven positions created through the grant from April to June this year. Previous quarters’ job reports contained anywhere from a handful of positions created to more than 100 new jobs. But even when the quarterly reports are combined, a total of 408 new positions were reported under the stimulus program since 2009, amounting to more than $300,000 spent for each new job reported. “A123 has been struggling for some time. Was the company struggling when the Energy Department decided to award it a federal grant? Did the Energy Department perform enough due diligence before making this award?” Republican Sens. Chuck Grassley of Iowa and John Thune of South Dakota said when they recently pressed Energy Department officials to explain the selection process. The company’s bankruptcy has spawned renewed scrutiny on the Energy Department after it backed several other businesses now involved in high-profile bankruptcies, including Solyndra LLC, the California-based solar panel manufacturer that went broke after burning through a half-billion dollars in federal money. Energy Department officials say the job creation numbers are misleading, noting that the jobs verified by The Washington Times through the government database don’t include many other positions that were created but not reported on the federal Recovery.gov tracking website. “Recovery.gov reflects a small portion of the total employees working on our projects — serving as a quarterly snapshot of only those workers paid directly with Energy Department funds,” department spokeswoman Jen Stutsman wrote in an email. The Massachusetts-based battery maker received a $249 million grant in December 2009 through President Obama’s stimulus program, of which the company received about $129 million before it went bankrupt this month. Like all other recipients of stimulus loans or grants, A123 Systems was required to report job creation statistics to Recovery.gov. Officials also say the grant was used for manufacturing equipment, so the jobs reported included workers responsible for installing the factory equipment, but not those who would later use that equipment during the assembly process. The company declined to discuss how it reported jobs through the stimulus program. In a quarterly report released months earlier, the company cited a weakening market and other factors for “negatively impacted” production levels. The language contained in the stimulus reports stands in sharp contrast to the optimistic talk of company officials less than two years earlier. “Over the next several years, we expect to create thousands of jobs in Greater Detroit and plan to continue our expansion in the area as we do our part in helping the U.S. emerge as a global leader in the production of advanced lithium ion batteries,” company President David Vieau said after the company opened a factory in Livonia, Mich., in the fall of 2010. The company’s seemingly bright prospects also got the attention of the White House. “There’s A123, a clean-energy manufacturer in Michigan that just hired its 1,000th worker as demand has soared for its vehicle components,” the president said in July 2011. Earlier this month, Mr. Grassley and Mr. Thune pressed Energy Department officials to explain whether the department performed “due diligence” before awarding the company so much money. “There were clear warning signs that A123 was having financial problems even as the administration continued pouring millions of taxpayer dollars into this failing company,” he said. 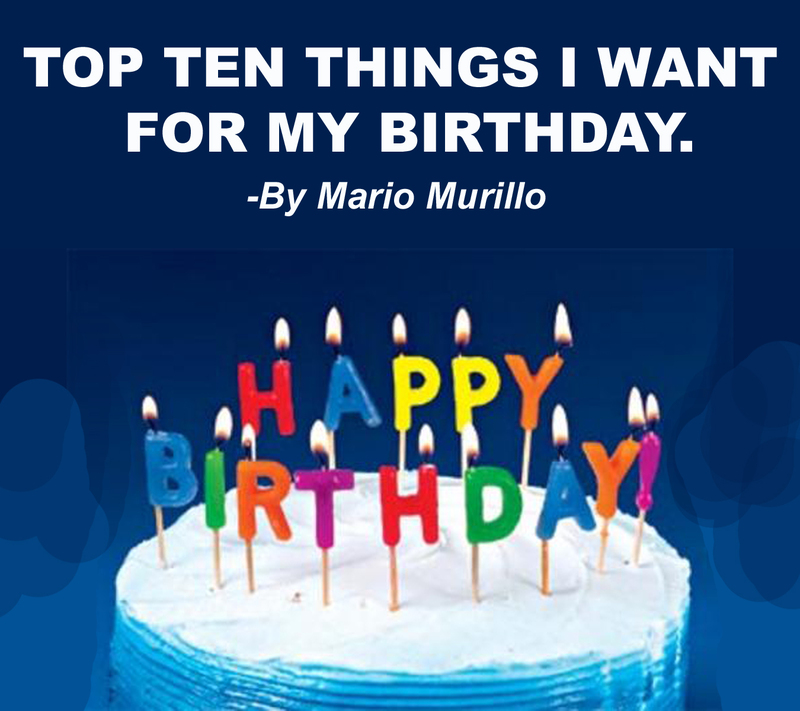 Top 10 Things I Want For My Birthday. 10. That it takes 6 wins to sweep the World Series so the Giants could win it before the home crowd. 9. The View forced to move to the Oprah Network. 8. Pizza starts causing weight loss. 7. Al Gore is forced to stop talking for the sake of global warming. 6. Donald Trump offers me 5 million dollars for my college transcript and passport applications. 5. Nancy Pelosi is fired first and then she reads it. 4. The Raiders go professional. 3. 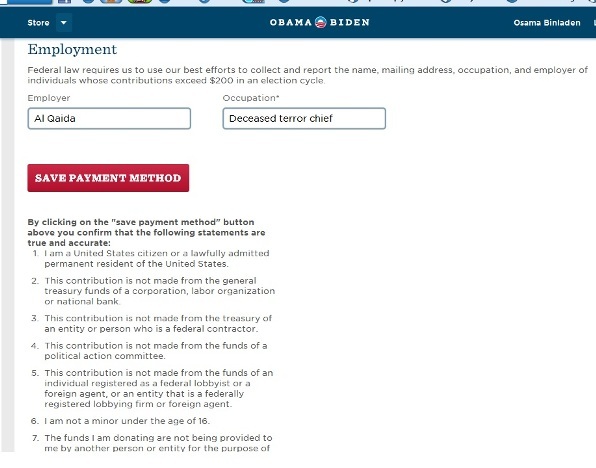 Joe Biden gets a jobs. 2. Yankees sold to the Philippines and renamed the Manila Folders. 1. 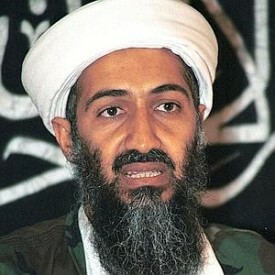 Barrack Obama is elected president of Kenya. 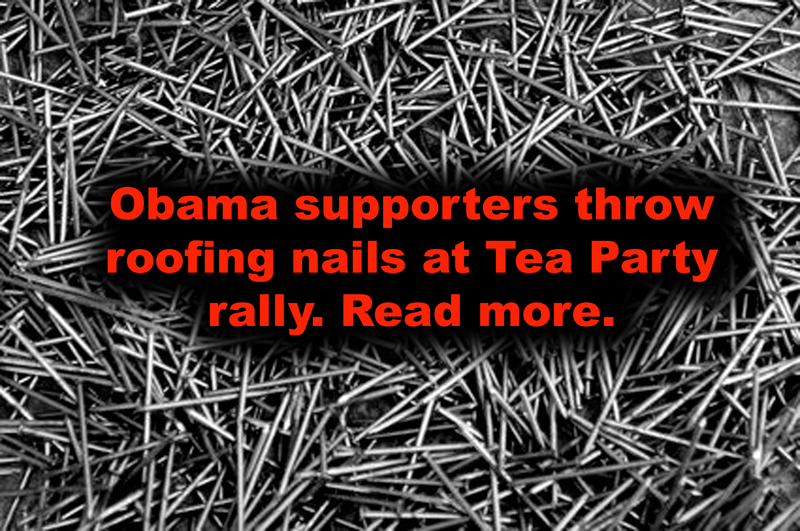 Obama supporter throw roofing nails at Tea Party Rally. The Tea Party faithful gathered Saturday for a loud and enthusiastic rally aimed at getting out the vote on Nov. 6 and putting Republicans Mitt Romney and Paul Ryan in the White House. The Racine Tea Party’s “Rally for Jobs” kicked off at 2:30 p.m. Saturday inside the old Sam’s Club at 6200 Regency West Drive. Before the event could get under way, though, organizers say a truck affixed with “Obama” stickers drove through the parking lot and dumped quantities of nails. Lora Halberstadt, a Tea party member, said the group did call the Racine Police Department to file a report. Patch asked two RPD officers outside the venue if they could confirm the report, but they only said they couldn’t comment about a truck. According to the shift commander on duty Sunday morning, officers responded to the old Sam’s Club Saturday morning to take a report from event organizers. Inside the venue, a crowd of around 1,000 grew to about 2,500, many of them waving signs or wearing t-shirts proclaiming their support for candidates on the Republican ticket. The list of guest speakers was a Who’s Who of conservative leaders — including local Republican state legislative candidates Pam Stevens and Tom Weatherston; and state Rep. Robin Vos; former Navy SEAL Chris Heben; U.S. Sen. Ron Johnson; Ryan’s brother, Tobin Ryan; former Gov. Tommy Thompson; Pennsylvania Sen. Pat Toomey; and conservative talk show host Vicki McKenna. Each speaker touched on points where they think President Barack Obama and his administration has failed, but their message also echoed that of the Democrats: take advantage of early voting and get everyone you know, and even those you don’t, to cast a ballot in what they called the most important election of our time. As for the vandalism, Patch also has a message into the RPD public information officer, and we will update this story if any other details are available. Green Bay Bishop David Ricken is shown here at the outdoor mass for the feast of the Blessed Virgin Mary in August. In a letter to parishoners this week, Ricken addressed the issues Catholics should consider when voting Nov. 6. • Read Bishop David Ricken’s letter. While Ricken’s letter does not specify who should get parishioners’ votes, Republican candidates typically oppose abortion rights while Democrats, to a large degree, support them. On the abortion issue, for example, President Barack Obama and Republican rival Mitt Romney have different views. The Democratic incumbent supports access to abortion without restriction, mandating free contraception for women and changing his mind this year to endorse gay marriage. Romney is socially conservative, opposing gay marriage and abortion rights and saying the government should not mandate free contraception. Jefferson County ‘Democrat Of The Year’ Convicted Of Felony Theft. JEFFERSON COUNTY, Colo. (CBS4)– The woman named “Democrat of The Year” this year by the Jefferson County Democratic Party has been convicted of felony theft by a Jefferson County jury for stealing from a developmentally disabled 71-year-old woman. “The jury did right,” said Cindy Maxwell, an advocate for the victim. On Thursday, a jury convicted 66-year-old Estelle Carson of felony identify theft and felony theft from an at risk adult for stealing checks from the woman and using them to pay her own cable, cell phone and internet bills. The victim is partially blind, developmentally disabled, has cerebral palsy and is confined to a wheelchair. She is on a fixed income of $596 per month according to the Jefferson County District Attorney’s Office. Nearly as bothersome as the theft itself to Maxwell and other supporters of the victim, is the fact the Jefferson County Democratic Party was made aware of the ongoing criminal investigation and honored Carson anyway. According to documents obtained by CBS4, in November of 2011, the Jeffco Democratic Party announced it planned to honor Carson for her activism on behalf of Democratic causes and her efforts to register voters. But three days before the January 8 gala, advocates for the victim contacted the party via email and phone informing them of the criminal investigation. Cindy Maxwell told CBS4 she informed Democratic Party officials that Carson had already confessed to the theft as part of the investigation. But Chris Kennedy, chairman of the Jefferson County Democratic party, dismissed the concerns saying there was not a conviction and bestowed the “Democrat Of The Year” honor on Carson. Kennedy reiterated to CBS4 that he went ahead with the award because Carson had only been accused, not convicted. “I did not have reason to believe it was true,” said Kennedy. Now that Carson has been convicted, Cindy Maxwell is asking the Jefferson County Democratic Party to rescind the honor. “I’d like to see her stripped of that award. I have been a Democrat my entire life. I’m disappointed they would allow something like that to happen,” said Maxwell. CBS4 called Estelle Carson but her voicemail message said her mailbox was full. She is due in court in December for sentencing. She faces a maximum of nine years in prison for the two felony charges.